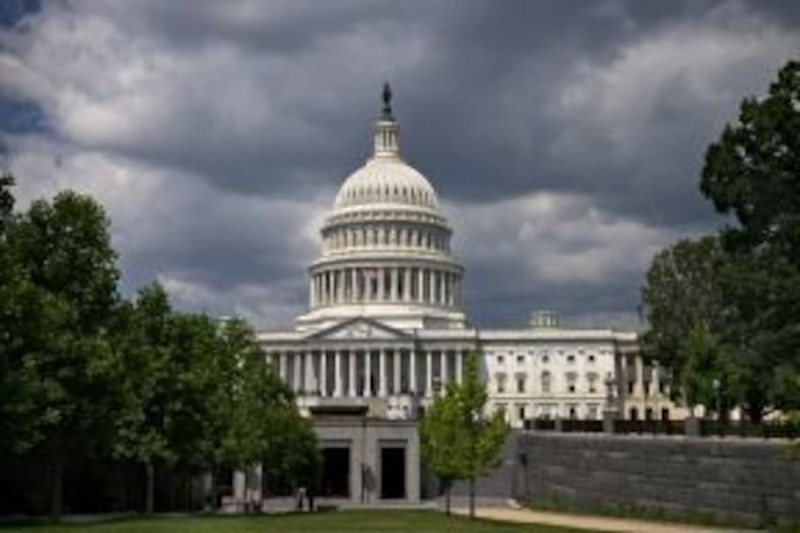 For Republicans with an eye on winning back the White House in 2016 — and beyond — the news of the death of immigration reform lands with a dull thud. If no legislation — whether a comprehensive approach or a more piece-meal one — moves between now and then, Republicans’ already-alarming issues with courting Hispanic voters will continue to make it difficult for the party to put together a winning national coalition. In 2012, Mitt Romney proved almost entirely incapable of winning non-white voters. He took just 27 percent of the Hispanic vote (that’s down from the 31 percent won by John McCain in 2008 and the 40 percent George W. Bush collected in 2004) and a meager six percent of the black vote. 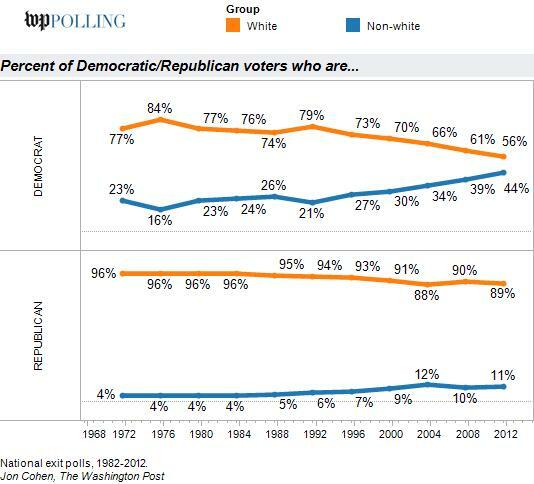 This chart — the single most important one, to our mind, from the 2012 election — paints the Republicans’ demographic/electoral problems in stark relief; only one in ten people who voted for Romney weren’t white. One in ten! Republicans’ growing inability to win non-white votes is problematic because the white vote appears to be in an irreversible downward slide as a percentage of the overall electorate. 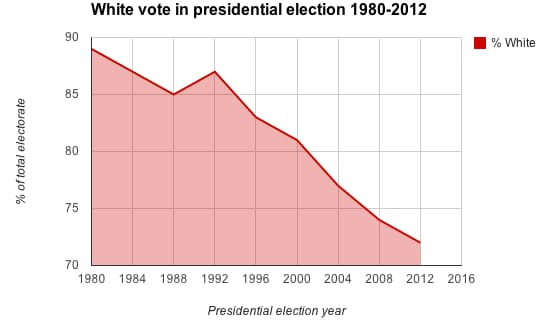 In fact, the white vote has declined as a percentage of the total electorate in every presidential election since 1992. But, what it likely would have done is a) make it much more difficult for Republicans to be attacked by Democrats as a party fundamentally unfriendly to Hispanic voters and b) allow the GOP presidential candidate (and other downballot candidates) to get beyond immigration to talk to Hispanic voters about other issues. The belief is that if only Republicans could be seen as credible messengers to the Hispanic community, the party could show/convince those voters that on other issues — particularly social ones — the GOP is a natural home for them. Making that case is significantly complicated not only by the fact that no sort of immigration reform package is likely to pass Congress but also because the blame for the lack of movement on the legislation rests squarely — for many Americans — on House Republicans. That is a giant problem for Republicans hoping to retake the White House in 2016. And, unless the party can find a way to win more than one in four Hispanic votes in future elections, the problem will be worse in 2020 than 2016 and even worse in 2024.